Cocktail party foods, as I said last week, aren't really my thing. But this one is my favorite. Gougeres (pronounced goo-ZHAIR) are these gorgeous little savory French puffs that never fail to impress. Everyone thinks they're difficult, but they're not. So you can come off like some sort of culinary genius with comparatively little effort or skill! 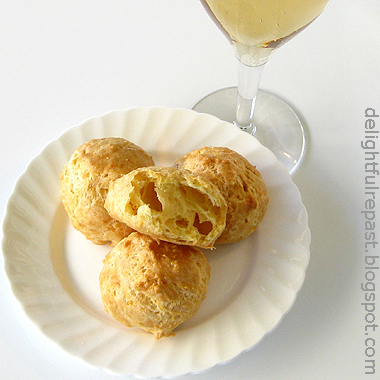 Actually, it is gougères, but I usually leave the diacritical marks out of my posts for simplicity sake. The recipe is just a variation on the pâte à choux (cream puff dough) I've always used for cream puffs, eclairs and profiteroles. So, naturally, while stirring these up my craving for all of those was stirred up! It's a safe bet you'll be seeing them here very soon! Gougeres, like their sweet cousins, are crisp on the outside and soft on the inside. Delicious with a glass of Champagne or other wine, it's a perfect addition to your HD (hors d'oeuvre) tray. Gruyere is the classic cheese, but a good Cheddar works equally well. 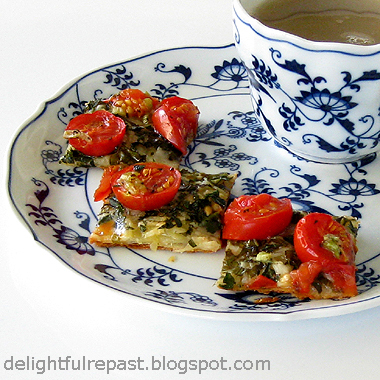 For a touch of green, stir in a teaspoon of finely minced flat-leaf parsley. What's your favorite libation and accompanying nibbles? 1 Preheat oven to 425 degrees. Line large baking sheet (I use a heavy-duty half-sheet pan) with parchment paper. Measure out all ingredients. In 2-quart saucepan, combine water, butter, salt and spices; bring to a boil. 2 Remove from the heat. Add the flour all at once, and stir with a wooden spoon until it comes together into a smooth dough. Return to medium heat, and stir until it dries out a bit and pulls away from the pan, leaving a film on the bottom of the pan, at least 2 minutes. Remove from heat, and let cool for 3 minutes. 3 Very vigorously beat the eggs into the dough one at a time, beating thoroughly after each until fully incorporated. Beat in the cheeses and the optional parsley or other green stuff, if using. 4 Pipe, scoop* or spoon small mounds of dough onto the parchment-lined baking sheet, spacing them 2 inches apart. Bake at 425 degrees for 10 minutes. Reduce heat to 375 degrees; continue baking for 20 minutes, perhaps 25. The puffs should be well browned and very crisp. * Using a scoop is the easiest, neatest method of forming the puffs. No messy pastry bag to clean up afterward. If you don't have a #60 scoop, get one now! Not just for gougeres, but for profiteroles, small cookies and who knows what all. The other scoop size I use a lot is the larger #40 scoop. Note: If you missed last week's post, go there now for more Cocktail Party Foods. It's been years since I've given a Smart Little Drinks Party. I'm more the cozy little dinner party type. But once in a while, one steps out of one's comfort zone, puts an extra coat of wax on the wooden surfaces and hopes for the best. I draw the line at setting out ashtrays. Of course, no one I know smokes, but if they did ... well, not in my house. Oh, and schedule the carpet cleaning for after the party, not before. You know I'm all about the food, so you're on your own figuring out the drinks. As far as I'm concerned, just give me a pretty stemmed glass of Pellegrino with a wedge of lime. I don't have much of a repertoire of HDs (hors d'oeuvres), so I'm turning to friends in the blogosphere for an assortment of small bites you can choose from for your next party. The only recipes I've blogged that fit remotely into this category are: Baba Ghanoush, Hummus, Pimento Cheese and Salsa. 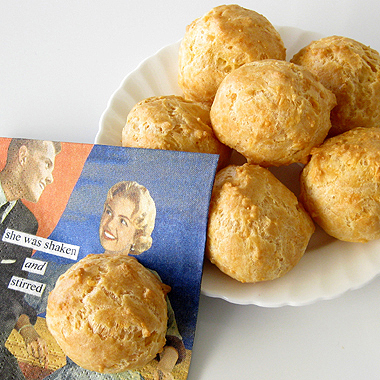 And I'll post my recipe for Gougeres (pictured above) next Friday. Cheese, butter, cream - what's not to love - and they can be made ahead! Make ahead, freeze, defrost, slice and bake - you can't not make these! Charles says "It's hard not to just stand next to the bowl and hog them all! I'm a sucker for anything that can be served on a cute little spoon! It won't be a party if you don't serve up a little something in filo cups! If you put it in a tiny tart, I'll even eat stuff I don't like - but who doesn't like onions and cheese! Every cocktail menu must have something in spring roll wrappers! A spin on the classic cocktail party meatballs! The bright, tart-sweet flavor of an orange can certainly stand alone, but mellow it out with a silky custard made with heavy cream and it's magic. 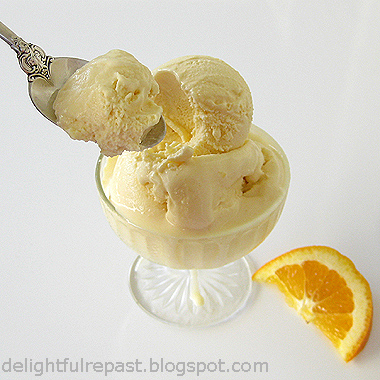 For a lighter frozen dessert, I might have made orange sherbet or frozen yogurt. For pure pow, orange sorbet. I was out of milk and yogurt but had plenty of organic heavy cream on hand, so ice cream it was. Orange ice cream isn't the usual thing, so I didn't even look for a recipe. I've made so much ice cream since I got my machine last year that I really don't need a recipe; I just make it up as I go along! Sometimes I make uncooked ice cream, but more often I make it with a cooked custard base. With all that juice, an uncooked ice cream could turn out icy. So I went with a cooked custard base to lessen the chance of iciness. Good call! This ice cream is soooo smooth and creamy. And scoopable. The flavor is reminiscent of my childhood favorite ice cream bar, Creamsicle® (also known as the 50/50 bar). Only this is super-premium organic ice cream. What a perfect way to celebrate the end of summer! 1 In heavy-bottomed 2-quart saucepan, heat cream just to a simmer. 2 While cream is heating, in 1.5-quart bowl whisk together sugar, cornstarch and salt. Whisk in the egg yolks until mixture is smooth. 3 Whisk hot cream into egg mixture, then pour mixture into the saucepan. Over low heat, stir constantly until mixture thickens and registers 170 degrees on instant-read thermometer, about 5 minutes; do not boil. 4 Stir in orange juice. Strain custard into a medium bowl (I use a 2-quart glass measure to make pouring into the machine easier); whisk in orange liqueur, vanilla and orange juice. Cover and refrigerate until well chilled, at least 8 hours or overnight. 6 Transfer the soft ice cream to a freezer-safe airtight container, and place in freezer for at least 4 hours. Even after days in the freezer, this ice cream was very scoopable and did not need to be left out for 15 minutes before serving. Note: Here is my review of the Cuisinart ICE-21. For more ice cream, sherbet and frozen yogurt recipes, go to the Recipes/Reviews index page.